You read the title correctly. The first time I heard someone say that, I thought it was some stupid joke. I had no clue that sabering a beer was a thing. Apparently it is. The concept is actually kind of cool. Opening your corked bottle with a knife in one quick swipe seems like a recipe for disaster. I've seen videos of people opening bottles this way and it never seemed like something I could pull off. At a tasting two weeks ago, our friend Parker attempted to saber a bottle and was quite unsuccessful. Granted there was a lot of pressure, and people generally seemed uncomfortable with the idea; so after a few failed swipes with a knife he aborted the mission for the night. Fast forward to last night. The topic came up in conversation halfway through our evening. We decided to give Parker another chance. I had a Cascade Strawberry that was nicely chilled and ready for action. I gave him a butter knife and we all went outside to the deck. Parker took a couple swipes and couldn't get it done. Rob then took his turn and was also unsuccessful. My turn. My first two swipes were futile. The third one, however, resulted in a nice "pop" sound and the cork went flying into my back yard. 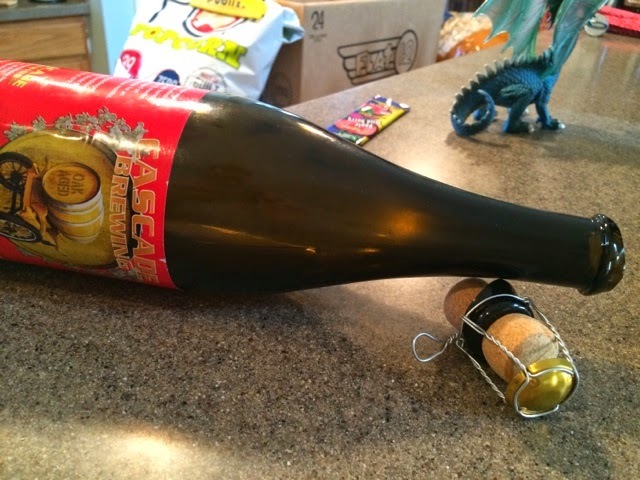 We all erupted into cheers as the beer slightly gushed out of the bottle. It is, without a doubt, a cool party trick that was awesome to experience. A couple of tips if you choose to try this yourself. 1. Be outside. You don't want this going down indoors because of various safety reasons. 2. Use a butter knife. 3. Find the seam of the bottle, I am told this is the weakest part of the bottle and if you strike in that area you are more likely to experience success. 4. Be aggressive with your strike. There are a lot of fears that can go through your mind when trying to saber your beer. "Will I shatter the bottle?" "Will I slice my hand or finger?" (Etc.). These thoughts will bring that glimmer of doubt which results in hesitation. 5. You should slide the knife up the seam and whack the bottom of the cage in one fast motion. Be sure to be holding the bottle tightly and at a 45 degree angle at least, if not higher. This allows a successful strike to send the cork flying. The end result is a clean break of the glass holding the cork in one piece. Completely safe to drink. Here is a pic of the bottle I sabered.